Note: Originally published on April 24th, 2009, this post has been updated on February 24th, 2011, and republished. 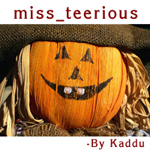 I am miss_teerious, 2.5 over 4 years old now, an original blog, created and maintained by this Indian girl, called “Kaddu”… who is slightly nuts, I think, but please don’t tell her I said so about her! On first glance, I’ll appear to you as a lighthouse against a cloudy blue sky… kind of “plain Jane” with my simple layout and drab white background! But once you start interacting with me, and getting to know me, you’ll realize I have more depth than the mighty ocean I stand towering over! Unlike most blogs on the internet, I don’t sell any products. And I don’t talk about any electronic gadgets and gizmos. I don’t provide any “How-To…” or “7-Tips-For…” information either. Nor do I offer any free products/services. And I definitely don’t give you any “beauty tips” here, because I think whoever you are, you are already most perfectly beautiful! I also don’t talk about sports, cinema, celebrities, fashion, pets, world economy, real estate, and loans! LOL! So then, what DO I talk about? You’ll find that I’m mostly filled with stuff you call “philosophical crap” and “far-fetched spiritual funda”! But this girl, Kaddu, she’s got a really twisted funny bone! And her “philosophy” is also usually lined with subtle, dry humor! In fact, you’ll be amazed to find yourself smiling even when she’s on one of her “emotionally-packed rants” about the *men* in her life! So yeah, I am definitely humorous! And I’m thought-provoking too! And I’m completely original, except for some images she uses off the net for adding some color to this “plain Jane”, and an occasional “email forward” she shares with her readers. That being said, I’m not a compilation of jokes or cartoons or other motivational/funny stuff doing the rounds over the internet! Pick me up if you need a bit of light reading… something thought provoking and yet, not too heavy… something that you can easily relate to! Turn my pages if you need a different perspective about life and its seemingly mysterious events! Ummmm… well you can also check me out if you feel like playing “Color Junction” any time! LOL! And finally, the story behind this lighthouse: You see, Kaddu has always wished she could turn herself into the powerfully majestic Sun! (Told you she was nuts!) LOL! Actually, she wants to become such a powerful source of light that “darkness” can never touch her life again! And that's why she simply wouldn't dress me up in any of the cool new themes and layouts available for google bloggers now! Sighhhhhh! Oh well, what can be done about it! She's the boss here! Anyway, she wanted to add her personal identity to her space on the web. So guess what she did! Yupp, she filled up the place with pumpkins - her official 'avatar'! Now there's a special pumpkin lighthouse in the sidebar, instead of the original lighthouse of this classic blogger template. And even the widgets in the sidebar are divided by pumpkins now! - The official Disclaimer in the blog footer. - The copyright information about me at the post - "Creative Commons License". - Awards given to me so far at the post - "Awards & Accolades". - And the Reviews/Testimonials I have received at - "Review 'miss_teerious'". @ "it was a serious dose of vanity "
... or maybe "it was a dose of insanity"! LOL! Not color junction again ! I have wasted a good amount of time playing with it on my IGoogle page till I removed it. :-). Will subscribe through GReader to stay away from the Color junction. Thanks for the visit btw! Heyyyyyy I see a lot of comments from u today! :D Thanks yaar! U just made my day! :D And it looks like u hv been checking out my hanging menu-bar on the top... ha ha ha! Comments on so many long-forgotten posts... thank you thank you soooooo much! KBL Mar 2011: In-A-Word Blogging! How To Get Your Own FREE Blog At Blogger?